The Frenchman's Food & Wine Blog: Coffee in Zambia - another good espresso discovery! Coffee in Zambia - another good espresso discovery! For all you espresso lovers out there who spend time in Zambia and can't get over the scarcity of a decent purveyor - check out the Southern Sun Ridgeway Hotel in Lusaka (better known to local taxi drivers by its previous incarnation, the Holiday Inn), located on Church Road, near the High Court. It's one of the few local hotels in Lusaka which give you that "western world" vibe, if you're into that sort of thing. And unlike many hotels in the "western world", the staff are plentiful, warm, friendly and obliging. 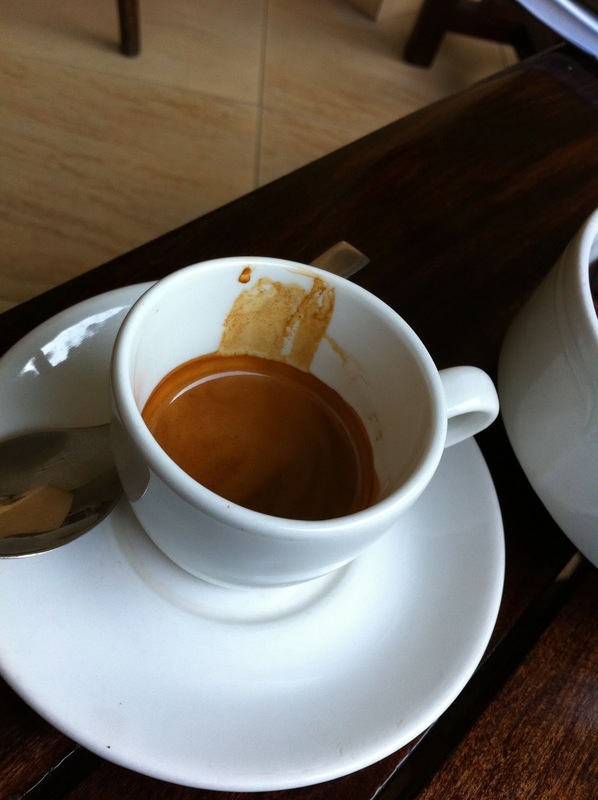 When I ordered my first espresso at breakfast there, I was already expecting thin coffee-flavoured water in a cup. But no - there was some promise! Sure, it was over-extracted and filled to the brim, but the coffee smelt good and sported a thick crema. So I decided to take a chance, and tried to show the staff how to make a decent espresso. At first, I asked them to turn off the water when the cup was half-full, but their natural inclination (or more water being better) caused some hesitation at the crucial moment. So I decided to supervise, and was pleased to see that all the proper prep was done - they pre-heated the cup in hot water and doled out a double-sized (must have been 15g-18g) of coffee grounds. And I told the staff member to stop the water when it was only a third-full. Even with the inevitable hesitation, the results were good! The picture says it all. They all looked at me like I was crazy, but I enjoyed my coffee so much I didn't care. 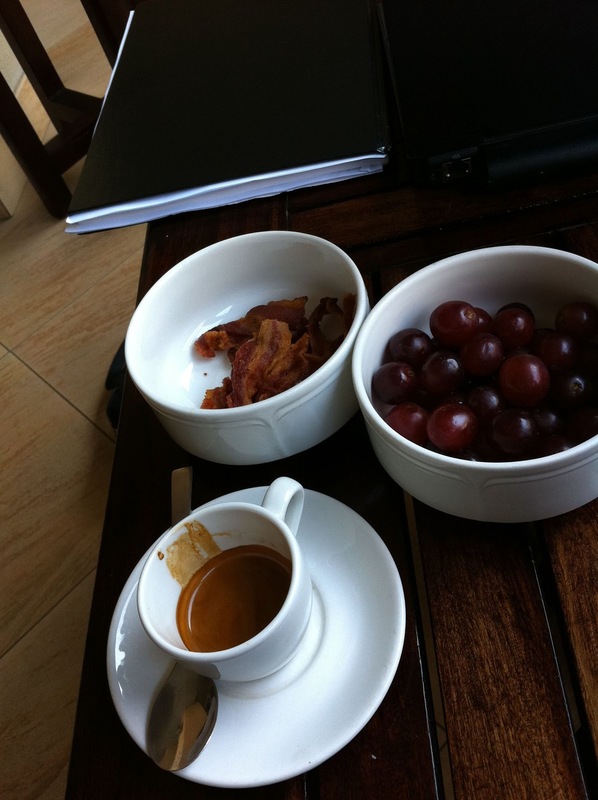 I also thought that you might enjoy the wider picture showing my pre-breakfast snacks - a bowl of crispy fried bacon (seriously, it's good), and hand plucked grapes. Grapes in Lusaka are insanely expensive - the equivalent of USD20 a kilo in the supermarket. But perfect with bacon. Kinda like a dietarily irresponsible version of peanut butter and grape jelly sandwich, but without the unhealthy carb-heavy bread. So if you're every in Lusaka, Zambia, and aching for a decent espresso, pop into the Southern Sun Ridgeway Hotel, and make sure you ask them for an espresso, but only a third-full. More on Zambian cuisine later.